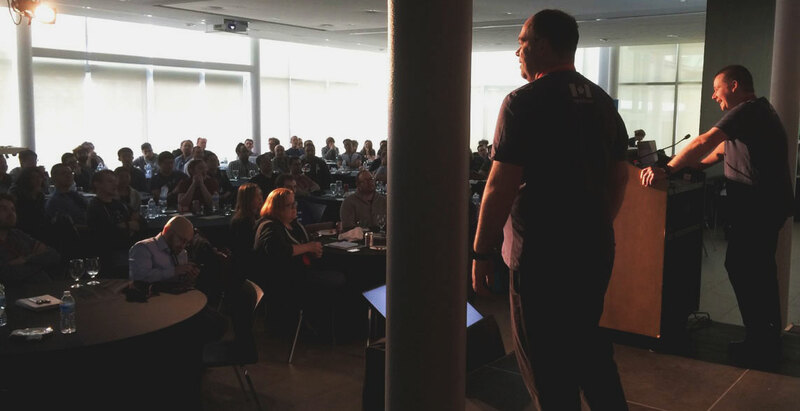 There was no shortage of compelling presentations at NSNorth 2016. Canada’s largest independent conference for iOS, Swift, and Mac developers – NSNorth 2016 – was a fantastic event and an intimate affair. Held over three days in late April in Toronto after relocating from Ottawa, this small but well-organized conference featured terrific speakers and presentations, a diversity of topics related to programming for Apple platforms, as well as networking opportunities, good food, and a tight-knit community eager to learn and support one another. On the first day of the conference, there was a Community Kickoff and Technical Workshop, which ran at the same time. Those who wanted to deepen their Swift programming language skills attended the Workshop, hosted by Daniel Steinberg. The Workshop received many accolades from attendees for its educational value, and Daniel got several kudos on his teaching style. This session also featured a 10-minute "How to Start in Perfect" talk by the main author of Perfect, Kyle Jessup. Meanwhile, the Community Kickoff featured talks that covered using technology to help and inspire youth. For example, Rebecca Garcia talked about why she started CoderDojoNYC while Andray Domise and Samuel Allemang shared their motivation for starting Techsdale, and Matt Garden shared lessons he learned about leadership while mentoring high school students in computer science to mentor younger students. Liz Marley, meanwhile, explained the origins of an organization she volunteers at called AppCamp which gives middle-school girls a safe and encouraging place to learn how to code. Elsewhere, Melissa Nightingale shared sobering observations about the lack of diversity in senior leadership. Dal Rupnik talked about how to build an effective team, and there were some very creative takes on technical subjects such as Anne Cahalan’s talk about Swift design patterns as Jane Austen heroes. In the main conference hall, the variety of topic presentations continued. These ranged from a focus on UIStackView (including live coding by Ayaka Nonaka), to how to approach building out a niche product (an engaging presentation by Jon Edwards), as well as two intriguing entrepreneurial startup stories from Robleh Jama and Rob Segal, respectively. All conferences offer time for networking, and NSNorth was no different in this regard. What made NSNorth unique, though, was the assortment of networking activities and formats. During the day, "Keynote Karaoke" was on the agenda. Someone would go onstage, and speak to six slides (each for 30 seconds) as if the slides were their own – the catch was as they had never seen the slides, which were slapped together in random order, it forced them to think and react quickly. It was hilarious for the audience, and although it may have caused the brave, voluntary speakers to break out in a cold sweat, it was terrific fun and challenged people to be creative and spontaneous. There was also a trip to the Hockey Hall of Fame. Given NSNorth was in Toronto, this venue made a lot of sense, and it gave the out-of-towners something touristy to enjoy. Moreover, there was a Board Game Night, where 10 games were carted out, and people picked a table to join. The evening was a casual one, prompting people to meet new friends and catch up with old ones in a comfortable setting. We had talks that shared personal vulnerabilities. Whereas Keynote Karaoke put people in a position where they had to tackle the unenviable task of presenting content out of context in front of a crowd, other speakers were giving their first public talks. Everyone came to learn something new and to make new acquaintances, and it was this shared honesty that led to some meaningful connections. People were comfortable admitting when they didn’t understand something, and the less-technical attendees didn’t mind asking questions of speakers about technical topics. When someone stood up to share word of the passing of a dear friend and express their grief at this news, there was genuine concern and emotional support. The fact that this happened at all is a reflection of how different NSNorth is from other conferences. There were also two children’s workshops. I signed up both of my daughters to the one in the afternoon, hosted by Daniel Steinberg. I did this because I had been impressed with his teaching style when I was in his try! Swift talk in March. He didn’t disappoint my daughters or me. In fact, my little one (9 years old) has decided she wants to learn to code now as a direct result of attending Daniel’s session. I asked them why they liked this workshop, and the gist was that Daniel struck a nice balance between sharing context, providing instruction, and giving the kids a chance to try and fail and learn. I appreciated that these Children’s Workshops offered more diversity and inclusion to NSNorth. On a more personal level, I appreciated that Daniel’s lesson inspired my daughter to want to learn more about coding (thank you, Daniel). I can’t let the moment pass without acknowledging NSNorth’s organizers. They are all good-hearted, hard-working people who did a tremendous job bringing NSNorth from Ottawa to Toronto. Everything they did was done to foster the diversity of perspectives and enhance Mac, Swift, and iOS developers’ learning and careers in an inclusive way. That’s a vision I can get behind. Congratulations and thank you to Dan Byers, Philippe Casgrain, and Adrienne Marshall – and all the conference volunteers – for working hard to put this inspiring and educational community event together! Not only is PerfectlySoft honoured to have been a sponsor of the 2016 NSNorth conference, but I am personally grateful that I had a chance to be a part of it.